Beautiful dark grape purple colored Natural Amethyst Quartz Crystal Cluster from Uruguay. 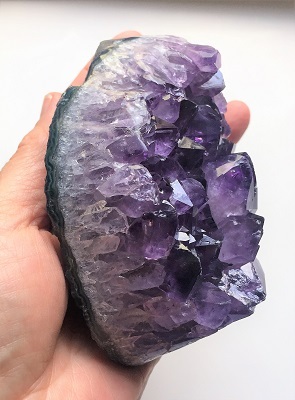 This beautiful Amethyst Cluster is a protective and supportive crystal enhances connection and awareness of the spiritual realms and stimulates the mind and psychic abilities. 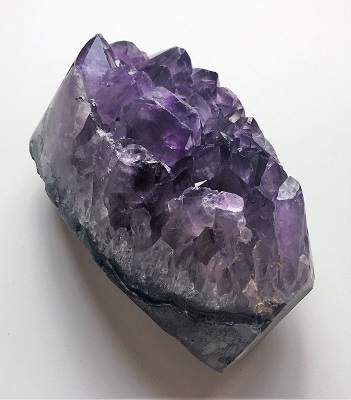 Amethyst provides clarity and assists one in identifying damaging beliefs, behaviors, and habits that have created an energetic imbalance in the physical realm. 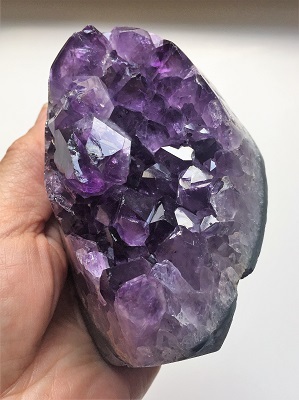 Amethyst allows one to gain a deeper understanding of the root cause of life experiences, which in turn, facilitates the ability to overcome addictions and blockages of all kinds. Amethyst helps to balance energies and to release feelings of anger, fear, and anxiety. 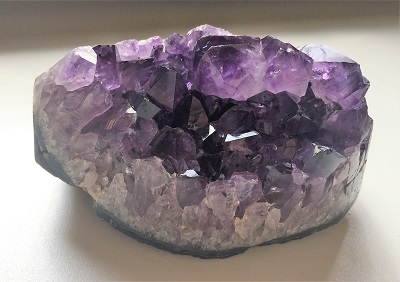 Amethyst assists in eliminating emotion-based decision-making allowing one to take actions based on higher guidance and spiritual understanding. In healing, Amethyst helps balance the nervous system and the brain. Amethyst boosts production of hormones, and tunes the endocrine system and metabolism. Amethyst strengthens the cleansing and eliminating organs and the immune system. Amethyst relieves physical, emotional, and psychological pain or stress. Amethyst may be helpful in the treatment of insomnia and brings restful sleep.